One of the advantages of living in a new house is the improvement in standards of draught-proofing and insulation of modern window frames, and there is a vast army of salespeople tramping the streets and wearing out telephones to bring these same advantages to those of us who live in older, more traditional homes. If you live in a house which has sliding-sash windows you will almost certainly have been targeted by canvassers ("We are not selling anything. . . just doing a survey") who extol the virtues of uPVC frames and sealed-unit double-glazing. You may have even succumbed to their sales pitch! If so, your once-new uPVC windows may now need replacing themselves, in which case, now is the time to restore your house to its former glory and fit timber sash windows. The appearance of replacement windows often clashes with the original proportions and style of traditionally built houses, something which many people will put up with as an inevitable consequence of making their homes cosier and more energy efficient. If you ignore the carbon footprint of the manufacturing of uPVC windows the claims of energy efficient design and low maintenance are indisputable. However, while it takes decades to recover the energy costs of uPVC manufacture, timber windows are actually locking up carbon for the lifetime of the windows and possibly beyond, depending on method of disposal. If old timber frames are burnt to produce heat, then that will save an equivalent amount of other fuel being used - timber windows are a bio-fuel! 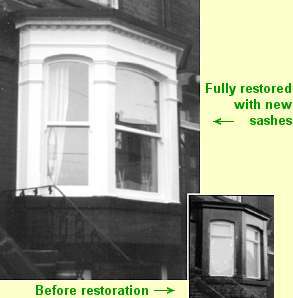 The advantages claimed by the manufacturers are not exclusive to uPVC, or even modern wooden windows; you can have both the style of your old sash-windows and most of the advantages of the new developments, by upgrading your existing windows and avoid using more of the world's increasingly scarce resources than necessary. It is quite common to come across original sash windows still going strong in houses built in the last century. Some firms installing uPVC windows offer ten, twenty or thirty year guarantees, but uPVC itself has not been around long enough to be really sure of its resistance to the combined effects of years of changes in temperature, humidity and solar radiation and certainly can't be expected to last long enough to recover the energy cost of manufacture. They may keep you warmer, but they actually add to global carbon dioxide emissions, rather than reducing them. Among windows the sliding-sash is uniquely repairable, most of the common problems can be sorted out with the window in situ, and replacement of the whole frame is rarely necessary. With uPVC it may be that, as time passes, its "no maintenance necessary" advantage turns out to be "no maintenance possible", and the only alternative is replacement. Upgrading the window to include draught-proofing and double glazing is a straightforward job, and unless the outer frame is seriously beyond hope, only the sashes themselves need to be replaced, a job which can be carried out with a minimum of disruption. You don't have to get rid of your sash windows. You don't have to shiver in cold draughts if you keep them. You CAN have the best of both worlds! Imperial College's cool sash window page about heat management using sash windows. Look Out - Greenpeace Briefing No.1, Installing New Windows. "Your choice of window frames could seriously affect the health of our planet."